Meet the speaker attempting to solve the biggest problem in audio engineering | What Hi-Fi? When companies design speakers, they have control over every physical facet of the final product. They can control the shape, size, material, type, directionality and deflection of the speaker drivers. They can control how those drivers react to an input, specifying magnets and voice coils, changing the material in the driver cone, the flange around the driver cone, the driver chassis and the speaker’s baffle. They can change components in electronic crossovers so that different drivers are responsible for different frequencies. And then they put it all in a cabinet of their choosing, one of an infinite variety of shapes and sizes, some with ports that allow the air inside to escape, others sealed to act as pressurized chambers. Different cabinets behave in different ways; again, the stiffness of materials used influences sound, as do standing waves that occur inside them as a result of the movement of the drivers they contain. Materials placed inside the cabinets can absorb waves, or cabinets can be shaped to prevent them from forming in the first place. Speaker manufacturers go to great lengths to control every element of the speaker design, using sophisticated listening apparatus and taking millions of measurements to ensure that science says they sound absolutely spot-on. Dynaudio goes a step further with Jupiter, a robotic chamber vast enough to hold almost an entire Olympic swimming pool’s worth of water and arrayed with 31 microphones. All this science and tech. And then you go and spoil it all by sticking them on a bookshelf when the manual specifically says they work best in free space. Speaker companies don’t know what you’re going to do with their products, so they have to make certain assumptions. They have to guess at where you’re going to place them and the shape of your room, because when a speaker starts playing, the room starts playing back. Standing waves form and music reflects off every surface. All act to muddy the pristine music emerging from the speakers themselves. The one thing a manufacturer cannot control is where you will end up using its product. That’s why Dynaudio made an intelligent music system that will work equally well just about anywhere. This intelligent music system is called Dynaudio Music, and thanks to a system called RoomAdapt, it can control its own behaviour. It uses a microphone to constantly measure how the room responds as it plays. "We compare the transfer function to a model based on data from many different speaker positions in multiple rooms," says Patrick Hegarty, the engineer responsible for tuning the Music range. "This allows us to predict whether the speaker is in a free, wall or corner position and apply an EQ that minimises timbral differences at low frequency due to its position." 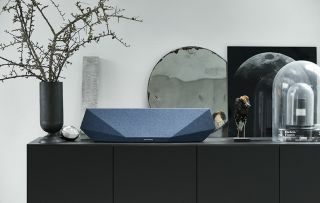 In other words, whether it’s placed on a high shelf, in the middle of a room or under a table, Music recognises its sonic environment and reacts to it by adjusting its output’s tonal characteristics, ensuring it’s always performing at its very best. ‘Its very best’ is a subjective measure, but one we can be pretty confident about. Like all Dynaudio speakers, Music systems have been painstakingly optimised in Jupiter, and voiced by the same golden ears responsible for the brand’s range-topping Evidence Platinum loudspeakers. They use the same MSP (Magnesium Silicate Polymer; a material developed in-house at Dynaudio) drivers and soft-dome tweeters you’ll find in Evidence, too, and they draw the DSP (digital signal processing) technology that enables RoomAdapt from Dynaudio’s high-end in-car audio installations for Volkswagen. The Dynaudio Music range comprises four devices – Music 1, Music 3, Music 5 and Music 7 – each packed with game-changing technology. All can gather music via Wi-Fi, Bluetooth aptX, DLNA/UPnP, Apple AirPlay and more, and can stream directly from TIDAL and internet radio stations. What’s more, RoomAdapt is complemented by NoiseAdapt, which measures the ambient noise in the room and adjusts the Music’s sound so that essential musical details are always loud and clear. Then there’s Music Now, an algorithm that learns your listening habits and can automatically generate a bespoke playlist at the touch of a button. Listening to what you want to hear is now as straightforward as turning on a radio (but without an annoying DJ in earshot). There’s a Dynaudio Music suitable for every room. The Music 1 is the pocket rocket, containing a 1in soft-dome tweeter, a 4in woofer, 80W of amplification and a built-in rechargeable battery for up to eight hours of portable listening. Music 3 is its bigger sibling, with two 1in tweeters and a 5in woofer backed by 120W amplification, along with the same claimed eight hours of rechargeable battery use. With 250W and 300W of power respectively, the mains-powered Music 5 and Music 7 will fill larger living spaces with Danish hi-fi sound. The former comes with two 1in soft-dome tweeters, two 3in midrange drivers and a single 5in woofer, plus an optical digital input. The latter goes further still, adding a twin 5in woofer and an HDMI input with Audio Return Channel so you can use it as a TV soundbar. All are wrapped in custom cloth from Danish textile house Gabriel, and can work together in groups of up to six speakers, arranged into multiroom groups or controlled individually from the Dynaudio app. And ultimately, that’s what it boils down to: control. Dynaudio Music is the intelligent music system that can control itself, so you can focus on what really matters: listening to brilliant music. To find out more about Dynaudio Music, click here.